A particular project I'm working on (a house style) will need a serif/sans pair of fonts. Currently, I'm at the "Identify some possibles" stage, but I'm not asking for suggestions. 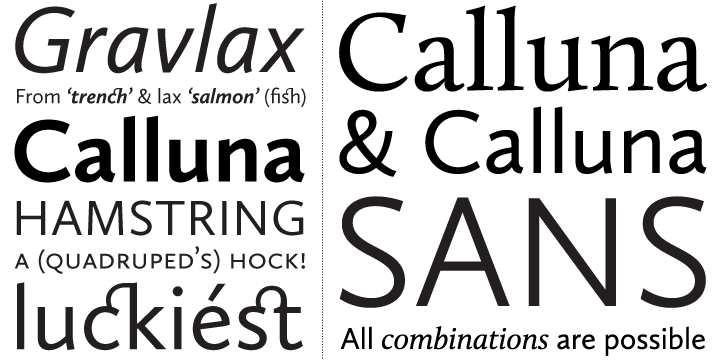 I'm looking for pairs like this because it's highly likely that serif and sans will need to be mixed in the same way as the last line of the Calluna image, where an odd word might be in the other style. It's not simply a matter of headlines and body type. Keeping the fonts used tightly paired, rather than simply mixing say Gill Sans and Perpetua or Joanna, allows the sizes to work exactly: x-height, cap-height and all proportions should be the same. It should also ensure that weight and blackness on the page are equal, and the letters are even going to be the same basic shape (unlike the two lower-case q's in Gill's fonts here). So these illustrate the problem: How do I search for pairs of fonts like this? These are three fairly obvious paired serif/sans fonts I remember, but there is such inconsistency in naming as to make searching difficult — and in any case Serif and Sans aren't particularly discriminating in a search. Is there a particular keyword I might use in searching font foundry/resellers' websites? I realise that there is no substitute for experience, but even experienced designers won't be able to remember every pair which might be suitable, and will have to have some aid to memory: what helps here? There isn't a clearly standardized name for serif/sans-serif paired families, but from what I can find, superfamily is the term most commonly used. You may also find references that use the terms suite, hyperfamily, type system, or family group. The notion of an extended, organised type family (or 'superfamily' if it contains different classifications too, such as a serif and a sans serif) is a relatively new concept, and has only been around as we know it today for just over a century - but nowadays there are plenty to choose from. We've rounded up 20 of the best to help with all manner of design projects. Not the answer you're looking for? Browse other questions tagged fonts font-pairing or ask your own question. Do all monospace sans-serif fonts look the same?